Shirts With Random Triangles: Ex-Florida QB Will Grier Transfers To West Virginia. 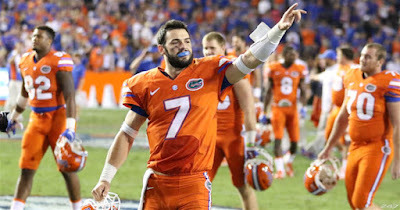 Grier announced his plans to transfer from Florida in December of 2015. This came two months after being handed a one-year suspension for violating the NCAA's policy on banned substances. Grier claimed at the time that he had taken an over-the-counter supplement that he didn't know was banned by the NCAA. According to Graham Watson of Dr. Saturday, Grier's suspension would have ended around the time of Florida's Oct. 15 game against Missouri. Since Grier's transfer would include having to sit out a year, things get a little more complicated. West Virginia will reportedly have to get a waiver for Grier to be eligible for the first game of the 2017 season.